In particular I was drawn to 'Alternative 1' where the author looked at a simple Lithium LA hybrid system. A diagram of the set up shown below. 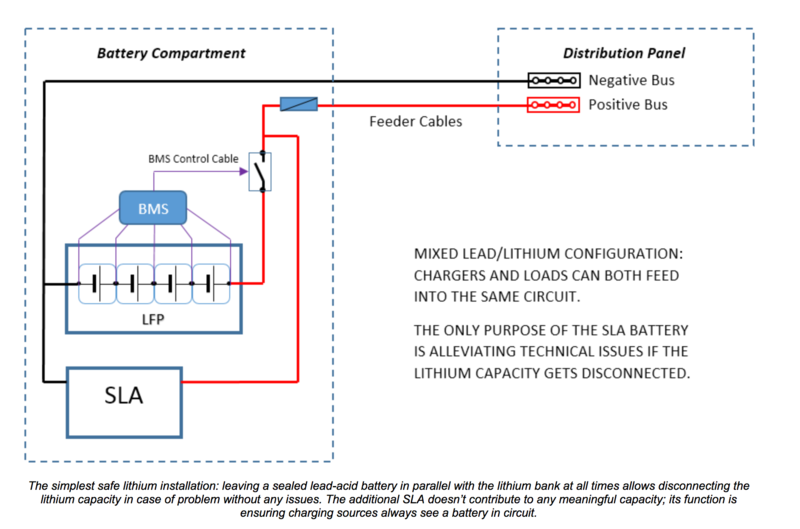 The essence of the hybrid system was to use the LA battery to avoid issues if the Lithium cells were disconnected due to high or low voltage. T&B thought this looked a simple way to try lithiums - do you still think this way? I was thinking of leaving our engine start battery in place – fed from our 50A alternator and retaining one of our domestic bank LA's to parallel with the Lithiums. In this way I dont have to do too much in the way of rewiring. The domestic bank will be charged via 3 sources, an alternator (90A), a Victron IP22 30A battery charger (with Li settings) and 500W of solar (may need to get a single MPPT controller). Loads will be normal boat loads plus a Victron Combi 2K but only used as an inverter. The first one is simple. Should I be buying single cells to build a 300-400Ahr (12v) bank or getting 12V batteries? Eric's link above says build it from single cells so that you can then measure voltage in each cell for the BMS so control the low and high voltage response. If you use 12V units, you are relying on the their own BMS and may not have any idea if individual cells are approaching high or low voltage. Lithium batteries need absorption like any other battery and disconnecting at 14.0V will produce very unsatisfactory results unless the charge current is very small. Charging will stop a long way short of the nominal capacity and serious problems will develop over time due to systematic lack of proper charging. The only fully correct charge termination condition is based on voltage and residual current, typically C/30. He re-iterates this later in the blog saying that you do need occasionally ie 4-8weeks, get to 100% charge. He seems to be saying that to get to 100%, you need to get to the absorption phase and then let tail current get down to say 2%...but that time is pretty short. For my Victron IP22 charger, the destructions say the Li battery will be 95% charged when it goes into Absorption and then be 100% charged in a further 30 mins. I would therefore be happy with my IP22 charging when on shore power and turning it off manually when nearly or fully charged ie either when it gets to Absorption or every couple of months letting it finish adsorption – and using an voltage sensed alarm to let me know when it started absorption. I am happy with the flexibility of my 2 MPPT controllers for Solar which I can set with a Bulk charge voltage of <14.0V (say 13.8V) and a float of 13.2V. The problem then is the Alternator. Our alternator produces 13.9v max as it goes into Absorption and only 30A or so (maybe 45A for the first few mins) so I have a Sterling AtoB in line which gives me 14.4V and 50-60A (of the 90A alternator). I can set the Sterling AtoB to 14.0V (there is a setting for US Gel at 14.1v but it then gives me 14.0v). The problem then though is that it will stay in absorption for an period but if the tail current is reducing fast then it should stop and the voltage falls back to 13.5V. One option is to scrap the AtoB, replace the alternator and add the VSR that Tom and Bex used. However, the VSR seems sooooo complicated. It looks a DIY, build it yourself jobbie. Is there a simpler solution? Can you turn off an alternator by disconnecting a feed to it – without delving into the internals, or will the field current generated keep it going? I've got a beta 43 and know when the wiring connector near the back of the engine detaches itself, the alternator doesn't charge! The use of the LA in the hybrid system protects the alternator when the Li's are disconnected (high or low voltage) but I need to be able to reduce voltage from the alternator in normal use and not rely on the disconnects. What other alternator charge controllers would do the job? Most of the discussion on here in the past 6 months seems to have focussed on reaching 80% SoC and stopping so avoiding any 100% charge problems but will this damage your batteries in the 2-4 year time frame as Eric suggests. He also cautions against charging at 14.0V and above,especially wrt to cells going out of balance - hence the need to monitor each cell closely. I've tagged T&B and Peter as I know they can help! Good to see another lithium battery thread. "Purely to reduce the amount of hours I'm running the engine to charge the domestic bank" sums it up. Can we please keep this one on topic and get some more great info from those who have dared? The thing I seem to be missing (more than anything else) is, how people are actually switching the batteries out of circuit (in an o/v or u/v event). Not the little circuit boards that do the sensing, but the actually presumably massive relays - presuming we want to control full domestic capacity which would mean several hundred amps at 12v? I think there is a 200amp thing from Victron but 3kw is more than that surely? Still not taken the plunge myself yet but desperate to - just need a slightly clearer road map. PS: Didn't jono do something slightly more elaborate with his LA alternator safeguard battery? Surely just parraleling with the lithiums will cause one type to feed the other and eventually discharge? This is basically what I'm going to do. The home-brew, Arduino based controller hardware is all done, and the basic software is in place: the computer can read the parameters it needs (LifePo4 cell voltage and current, LA battery voltage, four temperature sensors) to sufficient accuracy and control what it need to control (MOSFETs shunting the LiFePo4 cells for balance, the Lithium disconnect relay and an OLED display. This week I plan to work on the hard part of the software (Charge estimation, and making charge and discharge termination decisions.) The 480Ah bank, from the same source Tom and Bex used is expected to arrive this week or next. Photo shows the BMS hardware attached to my 3.5Ah test battery and light-bulb load bank. Amazing! Please share details if it works! In answer to your question, The system will be able to disconnect the Lithiium batteries when charged or discharged, and on cell u/v or o/v or over temp events. It also knows not to charge them below 5 degrees: discharge is allowed, but if charge current begins to flow the contactor will open until the LA voltage drops below the Lithium voltage. The LA battery is the start battery, and on discharged-state disconnect, the start battery will keep the lights on. A loud audible alarm sounds to warn you that you're using the start battery capacity in this case. It’s better to turn the devices off using the remote switch, most decent inverters and chargers will more likely have one. Perhaps I’m wrong but the first time you forget to switch it off, or turn it off late, don’t you damage the batteries irreparably? Could someone please remind me what the reasonably priced source of these second hand batteries that people are using is please? What do you call reasonable Nick? To me they are still a completely stupid idea at present. Maybe to you, but not to me! 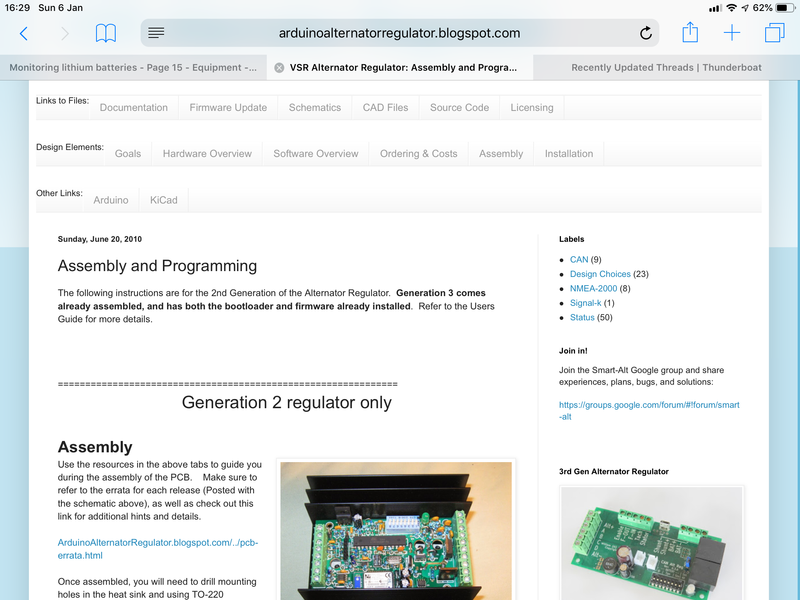 first, its really good to see a bit of DIY electronics and software going on. I would love a set of lithiums and might even get some in the future, but I still find it hard to justify the cost and am not convinced that, for me at least, the saving in engine running hours is going to be that great. In the summer we cruise loads so most days the batteries get full to the brim, lithiums would not really help here. A more static boat would likely have a load of solar so again no big advantage for the lithiums. In winter then we need to run the engine everyday or every second day, usually for 2 to 2 and a half hours. I can't really imagine starting the engine and running for less than 2 hours as I never like to stop an engine till its very nicely warmed up. It also does the hot water and is usually running the washing machine via the TravelPower so two hours is about right. no big lithium saving here. So the big lithium gain is not having to do the big 100% charge once per week, and the equalisation, though the above posts do suggest that there are still "maintenance charge" requirements with lithiums. I am not too worried if I only do the 100% charge once every two or three weeks so in my case the total annual saving in engine hours is really quite small, and I can often co-incide the 100% charge with a cruising day. I do think this forum has gone a bit off track of late with too many people saying you need a 100% charge everyday. Another advantage of my Trojans is that I aim for no more than a 50% discharge but am happy to go down to 40% or even 35% so can often get away with an extra non running day if its convenient, Can't do this if the lithium bank is sized to have nothing in reserve.. Checking and topping up the Trojans is certainly tedious. but this happens about 6 times a year and takes less than an hour so is not really a big deal. I am watching the lithium debate with interest, but can't see the financial argument at this stage. Probably! For the time being I am happy with our Trojans on the boat. However I am fed up with rubbish leisure batteries in my caravan at the gliding club and want something like 100AH at “12v” Lithiums. No mains power and solar panel useless at this time of year. Fed up with the genny running for ages just charging at 6A or whatever. Once I have mastered the dark art of Lithiums in my caravan, I will be well placed to fit to the boat in the fullness of time when the Trojans expire (which hopefully won’t be for several more years). I guess Johnny and I are in the same position needing a clearer road map. 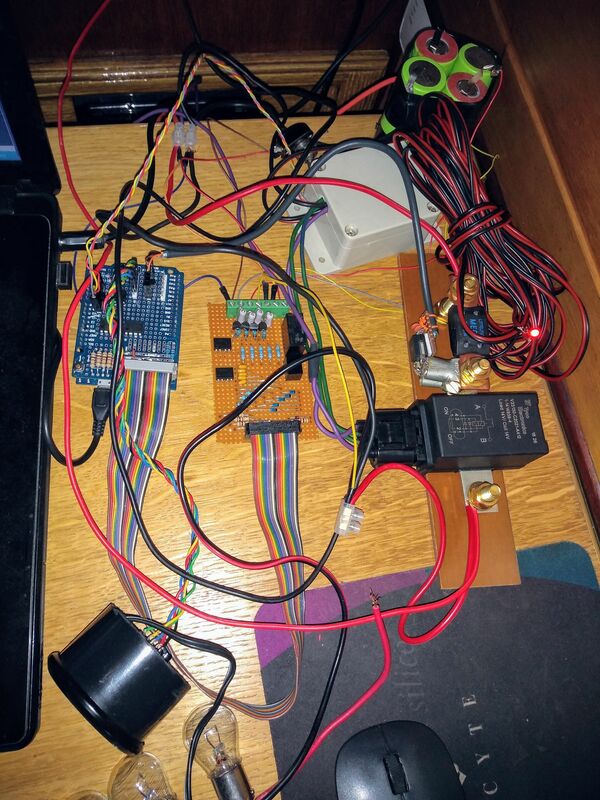 I read MP's posts in a previous thread but the diy controller will be too much for my brain, especially when having to programme it. Happy about the controller to switch high and low voltage, but as Johnny says, what relays etc? I am though more interested in how to switch the bloomin alternator charge off. Any thoughts? Surely T&B’s smart alternator regulator is the way to go? Well yes.....unless you are a muppet! Following the links, it seems to be a diy self build and the links on the blog where it is described are a bit (lot) over the top for me. Now if it was an off the shelf item then no problem. I am only at the very basic level programming a Rasp Pie and this seems well beyond my skill level. Are there any off the shelf units with that functionality? The manual for the IP22 says it has a Li charging mode and it quotes an absorption of 14.0V. I guess it turns it down to float (13.2V IIRC) after 15 mins so will not take the batteries above 100%. This should be ok if then you have a load on the batteries to avoid leaving them at 100%. My strategy would be to have an alarm for 13.9V and turn off the charger manually at this level but if I missed the alarm then the worst case is that the batteries would go to 100% and then the charge would stop...which according to the author is what you need to do every 1-2 months. The question then is....is Eric the Author right? Would something like this help protect the alternator from the shutoff spike? Seems like it does the job? 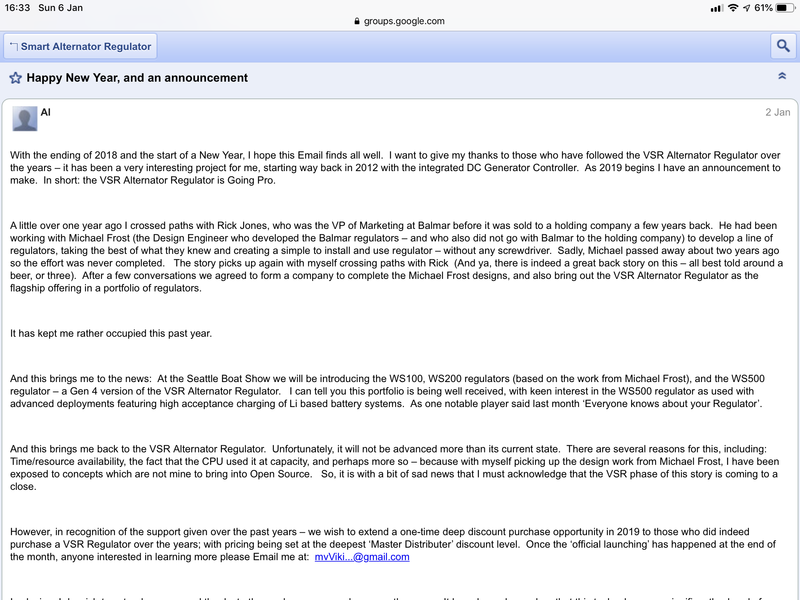 amd secondly, it seems like the product is being taken to market. No idea on pricing though! The manual for the IP22 says it has a Li charging mode and it quotes an absorption of 14.0V. I guess it turns it down to float (13.2V IIRC) after 15 mins so will not take the batteries above 100%. It's more complex than that: You need to limit the voltage to 14.0, then ride the current down to relatiively small value, around 10A. Then it drops to a voltage which is low enough that the charge current is effectively zero, so not "float" in the LA sense, but doing the same job at the same point in the cycle. There's an argument about if this matters for boat domestic batteries. The great advantage of Lithiums is that you can leave then hovering around the 30% - 80% range where boat batteries tend to naturally lie, without going to great efforts to regularly fully charge them, like LA needs. Given that, a charging regime which cuts off at 85% or 90% is fine, and much better than one which goes to 105%. This is not the area where you see most discussion on Lithiums, which is electric vehicles. There you need to get as much charge in as you can, and discharge as far as you can, with a predictable discharge cutoff. Range (and range anxiety) is all. Thanks for that Nick, I was getting rather lost looking through that site. I will follow it up and see when it will be commercially available. With your superior knowledge of things electrical (and alternators), can you make out from the site what intenal changes are required in the alternator to make this controller work? I I am though more interested in how to switch the bloomin alternator charge off. Any thoughts? You don't need to switch the alternator off. Everything is connected to the lead acid battery, including the alternator and all the loads. When the Lithiums are full, the contactor isolates them from the lead acid side, so the lithiums stop charging. The LA is still loading to alternator, so it doesn't go bang, and continues to float the LA and support the loads. The BMS has to be able to sense the LA voltage, so it knows when the engine has stopped and the LA is no longer at float, then it closes the Lithium contactor again. Yes, I agree but I thought that is what the IP22 would do in LiFePo mode ie once it got into absorption and set the voltage at 14.0v, the current would drop as demand from the batteries would drop and the IP22 would reduce the voltage to 13.2V after say 15 mins. The IP22 cant be using tail current to work out when to end absorption as it will not know the size of the battery bank so cant work out a % so it must just use time to control when it goes from Absorption to float. I am further assuming that when it goes to 'float', it reduces voltage to 13.2V but as the batteries are then 14.0v or so, very little current will flow from the charger. Is that thinking right? The﻿ great advantage of Lithiums is that you can leave then hoveri﻿ng around the 30% - 80% range where boat batteries tend to﻿ naturally lie, without going to great efforts to regularly fully charge them, like LA needs. Given that, a charging regime which cuts off at 85% or 90% is fine, and much better than one which goes to 105%. And if I understand matters correctly it is actually detrimental to leave Lithiums at 100%, is that not correct? So other than the occasional lift to 100% for top balancing (although Peter suggests this is rarely required) you’re actually better off never taking them to 100%. Yes? I do know that once the batteries are close to 100% then there must be NO current still flowing into them. Otherwise they’ll go over 100%.